This is my 19th Portrait painting, the 389th Chinese Xieyi Painting and my 714th painting since 2003 and the 106th assignment in Chinese National Academy of Arts. Do you know who he is on my painting? Zhong Kui -- a god who exorcises ghosts and evil spirits. It is said that Zhong kui lived in Zhongnan Mountain in the early Tang Dynasty (618～712). He had a very ugly surface, but, a talented mind and very integrity. In 712, Zhong Kui went to Changan today's Xian to take the imperial civil examination. Impressed by Zhong's five poems and articles, the chief examiner praised him as a prodigy and enrolled him top of all examinees. However, during the highest examination, a treacherous minister judged Zhong Kui by his appearance, and repeatedly spoke ill of him before the emperor. As a result, Zhong Kui failed to claim championship in the exam. Infuriated, he bumped his head against a pillar in the palace and killed himself. Then the Emperor Dezong issued an imperial edict, conferring upon Zhong Kui the title of Demon Queller who traveled all over the world to kill the evil and expel the wicked. In addition, the official title of Number One Scholar was also buried with him. Since then, the Paintings of Zhong Kui Catching a Ghost have been very popular among the folk people. Depicting Zhong Kui catching the evil spirit, it is believed to convey the message of avoiding calamity and bringing on good fortune. Therefore, people often buy the painting on festivals and put it up at home. At the first, people hang the paintings of Zhong Kui on New Year's Eve only. Currently, on Dragon Boat Festival (5th day of the 5th lunar month) people paint Zhong Kui, hang the picture in their own houses or give it away as a present. The change originated in 1757, the 22nd year of the Reign of Emperor Qianlong in the Qing Dynasty. Many people died of plague that year. Helplessly, people resorted to Zhong Kui for help. They bought and put up Zhong's paintings and expected him to exorcise the evil with his might. In the following years, the practice was continued and gradually developed into a custom. 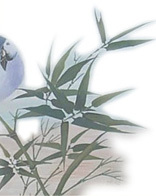 There are many different Zhong Kui Paintings. This is my first one.